KATIE: Waffles, you are SO busted. 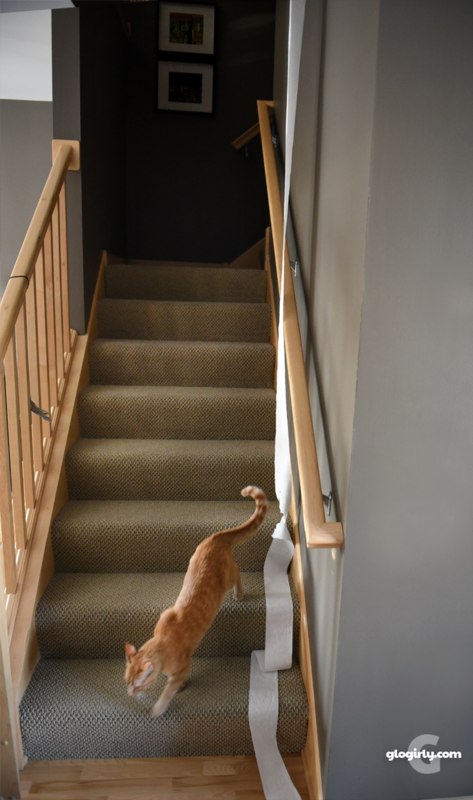 KATIE: The steps, the floor, upstairs, downstairs... who KNEW there was so much paper on one of those little rolls. You are SO in trouble. I am certain it just got stuck to your foot while you were using the facilities Waffles. No way would you actually TP the house! Are you ever *not* in trouble, Waffles? Waffles, I guess you are a papered kitty now. nooooooo...these photos MUST have been 'shopped! There's NO WAY Waffles could have been involved in this Paper Caper! I have been laughing so hard about this! Oh, but it was totally worth it! Someone has set you up, Waffle ? Quick, roll it back up! They will never know! That is awesome. Party on, Waffles! I think he was framed. 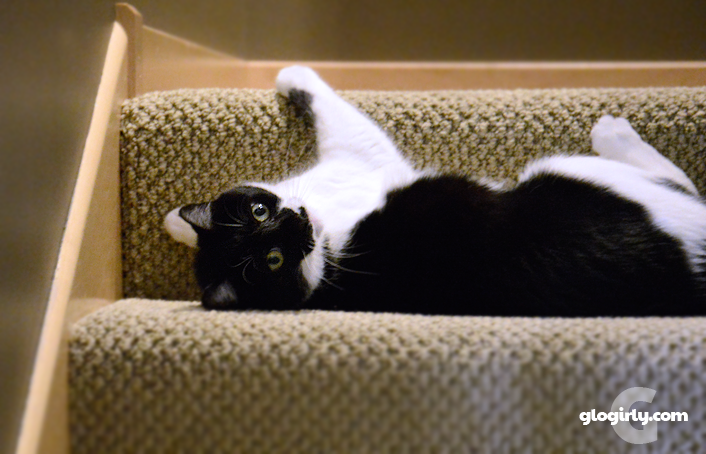 Katie is not looking innocent (very cute though!) in that picture. 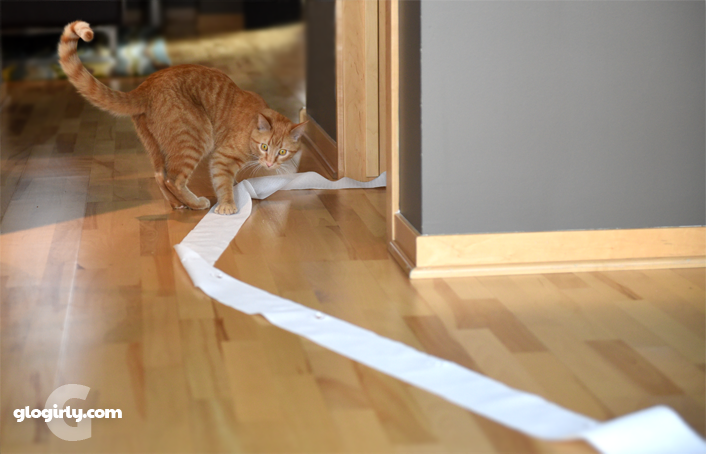 What a paper trail, Waffles! We wonder if this means a new location for the TP? I bet it looked good as it went bounce bounce bounce down the stairs Waffles. Oh Waffles! What ever did you do? Waffles we love how the camera always catches you! We laughed and laughed and laughed!!!! 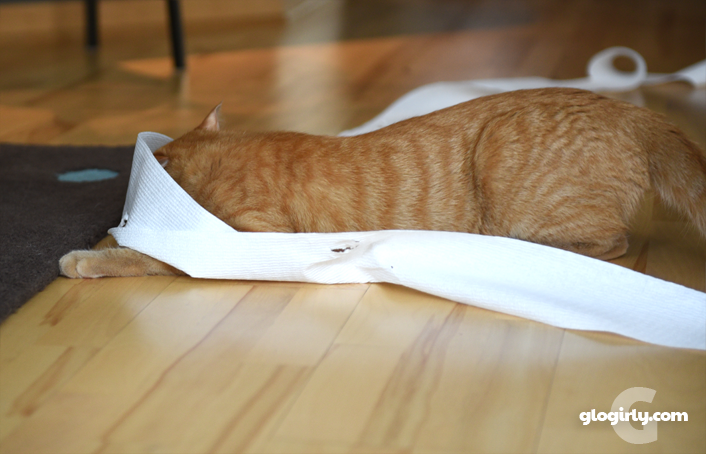 I bet is mom was happy for the blog fodder..
Waffles, that's the longest TP roll we've ever seen! That was just your way of letting glogirly know she was out of TP, wasn't it? ROFL. Reminds me of a kitty I had many years ago. *points and laughs* Oooh, you're in trouble, buster buddy! You are so lucky Waffles, you have a two story place and TP that is loose. Mum keeps hers inside a cabinet that I can't open! I still prefer to dump the TP in the full tub. MOL! That’s such an adorable pic of you, Katie. Maxwell: dood, you are seriously busted. Craaaaaazy Cat!! Katie, looks like you are enjoying the fun! You look like you are having a great time Waffles! Awww, Waffles! It's the look on your face when you are doing these crimes that gets me laughing every time. You know darn well that you are doing crime - and you LOVE doing it - yes, you do! Wow, no one in our house has ever done the TP. It looks like fun!